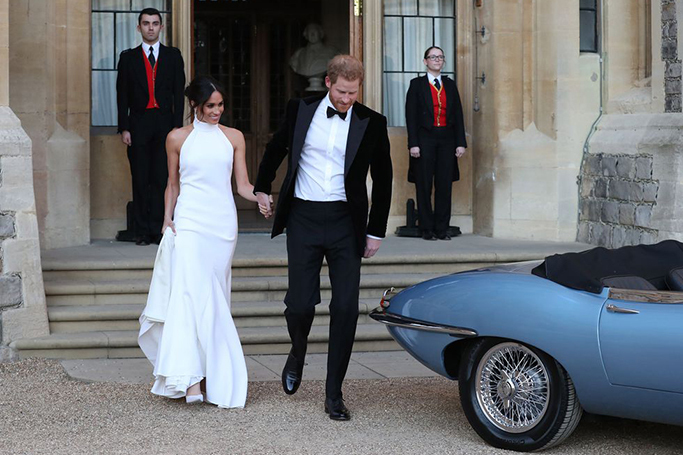 Both dressed for their regal wedding reception, Prince Harry and his wife Meghan left for their reception with around 200 guests at Frogmore House, on the Windsor estate, in a 1968 silver blue Jaguar convertible. As, the just married couple couldn’t be any more adorable! The newlyweds looked smitten with each other following their nuptials at St. George's Chapel earlier that day, as Meghan Markle particularly stood out in her evening wedding dress by Stella McCartney. Stella McCartney seemed the perfect choice for Meghan Markle, as the fashion designer’s signature style features sleek cuts and minimal, classic designs which complement Markle’s own style. McCartney is also committed to eco-friendly fabrics, vegan leathers and conservation –causes which both Meghan and Harry believe in. Meghan Markle’s shoes with painted blue soles were not her only “something blue” in her second bridal look, as the Duchess of Sussex also wore a breathtaking aquamarine cocktail ring which belonged to Princess Diana. It is thought that Prince Harry wanted to include his late mother in his wedding as much as possible, as he poignantly gifted the ring from his mother’s collection to his new wife. Congratulations to the Duke and Duchess of Sussex –it was an amazing day watched worldwide, as we loved celebrating the royal couple here in Dubai!